If you want to get a real sense of the grandeur of this ancient Italian city, the two-hour film La Grande Bellezza is an ode to the pure sensual overload that is Rome. Exhibiting its many piazzas, world-class museums, baroque archways, trattorias, and gardens, the film also captures Rome’s central raison d’etre: food and wine. And rightly so. There is nothing more Roman than enjoying a tasty wood-fired pizza in a packed pizzeria or dining alfresco just outside a glorious hotel Rome. 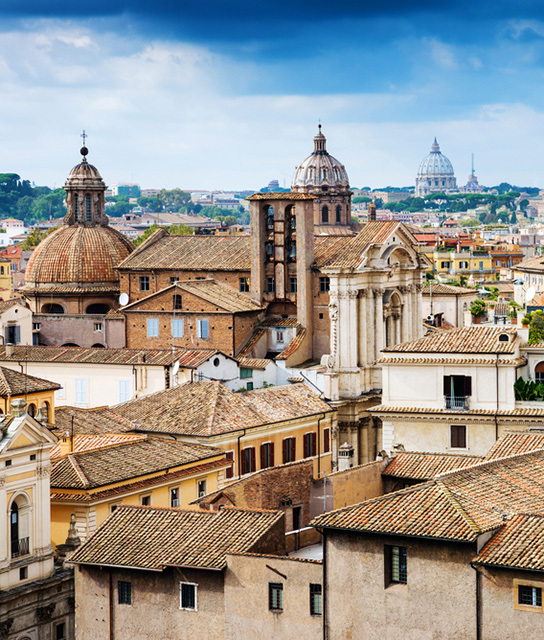 The first caput mundi (capital of the world), Rome is a buzzing city that has grown layers upon layers like history itself. Walking around the center, you’ll come across masterpieces such as sculptures by Michelangelo, paintings by Caravaggio, and fountains by Bernini. And though set in 15th- or 16th-century buildings, hotels in Rome boast modern interiors. This unique dichotomy extends to designer bars, neighborhood markets, and more. Below find a list of our selection of boutique and luxury Rome hotels. G-Rough showcases an unconventional “Made in Italy” concept of luxury in Rome’s Piazza Navona. A restored 17th-century palazzo in the heart of the historic center takes travelers on a luxurious journey through Rome, past and present. Reflecting local history through design while contributing to the art scene of the now, this architectural landmark puts guests in the creative heart of the action.